Bowmore, Islay’s first Single Malt whisky, has announced the launch of Bowmore 23 Years Old – a deliciously rich, smoky and complex dram that has been matured exclusively in port casks for 23 years giving it a deliciously dark colour and remarkably rich flavour. This non-chill filtered Single Malt Scotch is a whisky to warm the coldest Islay night. A delicious feast of smoke infused blood orange, luscious layered autumn fruits, winter spices, black truffles and walnut oil balanced with the trademark Bowmore sea-salt tang. This outstanding limited edition is the ideal whisky to add to any enthusiast’s collection. Presented in packaging that reflects its quality and exclusivity, this revered dram is encased in a deep-red hinged box, which perfectly complements the deep mahogany liquid. A black clasp keeps the whisky locked away. Once opened it reveals a certificate handwritten by the Bowmore Distillery manager Eddie MacAffer. 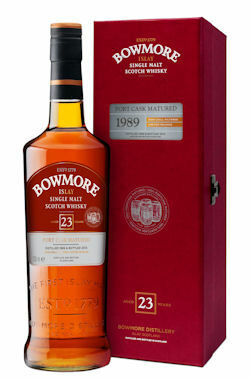 Bowmore 23 Year Old is available from July.